All the rumors are finally over as Samsung took to the stage this morning to announce its latest large-screen handset, the Samsung Galaxy Note 5. 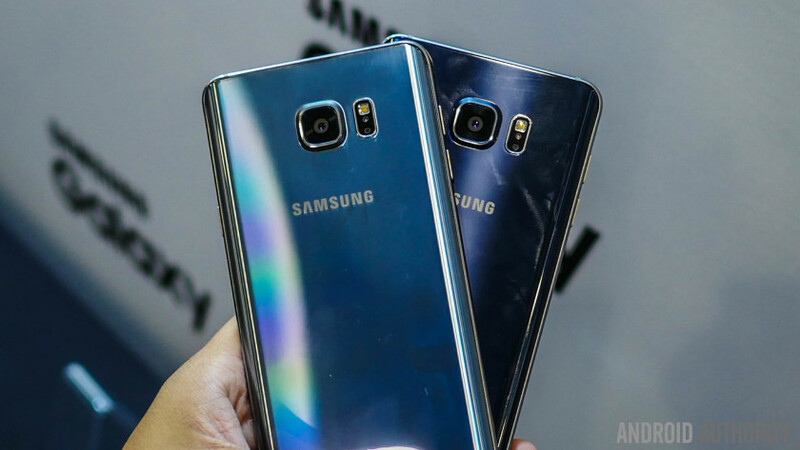 In the past, the Note series has generally taken a different design approach from the Galaxy S series, but one of the first things you’ll notice about he Note 5 is that it will strongly remind you of the Galaxy S6 series, for better or worse. Is the Korean manufacturer’s “true flagship” all we were expecting? This phone is huge, but we have managed to get both hands all over it and are ready to give you our first look at the Samsung Galaxy Note 5. Let’s jump right into it, shall we? If you think the Samsung Galaxy S6 is a beauty, you will also love the Galaxy Note 5’s aesthetics. This is because the new handset adopts the design language that was introduced with the S6 series. The Note 5 has a sleek unibody design which consists of a couple materials. There’s a metal edge all around the handset, while glass covers the front and back. One large difference is that this phone has a couple edged sides like on the Galaxy S6 Edge, but these are on the back. This will give the user a much better grip on the rounder rear, not to mention the fact that it happens to look great. My only gripe is that there is still a protruding bump around the back camera. The flash and the heart-rate monitor are located right next to this shooter. Everything else is where you would expect it to be. We can find the volume rocker on the upper-left, the power button on the right side, a home button/fingerprint reader right below the screen and a SIM card slot on the top side of the phone. And we can’t forget that S-Pen slot, which is located on the bottom-right and operates via a spring-loaded mechanism. The Samsung Galaxy Note 5 looks great, but I would be a little worried about its unwieldy nature. Larger smartphones are usually more prone to accidents, and the Note 5 isn’t exactly thin, either. We will have to test it more to pass judgement. The Samsung Galaxy Note 5 comes with a massive 5.7-inch Super AMOLED panel with a QHD (2560x1440p) resolution and a 515 ppi pixel density. Samsung smartphones are known for featuring some of the best displays in the market, so we are sure the Note 5 won’t disappoint. Its high resolution will ensure all text, images and videos are as crisp as ever. And if you like deep blacks are vibrant colors, Super AMOLED screens are king at offering those. We can assume the Samsung Galaxy Note 5 will be just as fast as the Galaxy S6; it sports very similar specs. Inside it you can find a powerful 2.1 GHz octa-core Exynos 7420 processor backed by a Mali-T760 MP8 GPU. In addition, those 4 GB of RAM memory should keep your multi-tasking sessions smoother than ever. We all know speed and power don’t make a great phone; there’s plenty of other factors to consider. Let’s start by touching on storage options, which are not too varied. You can opt between 32 GB or 64 GB of internal memory. Need more? Then you better look somewhere else, because this phone has no microSD card slot. It also has no removable battery, which is something we suspected would happen. The 3000 mAh battery might seem a bit small here, but on the bright side, you will find wireless charging and quick charging support which at least helps make up a little for the samller battery. 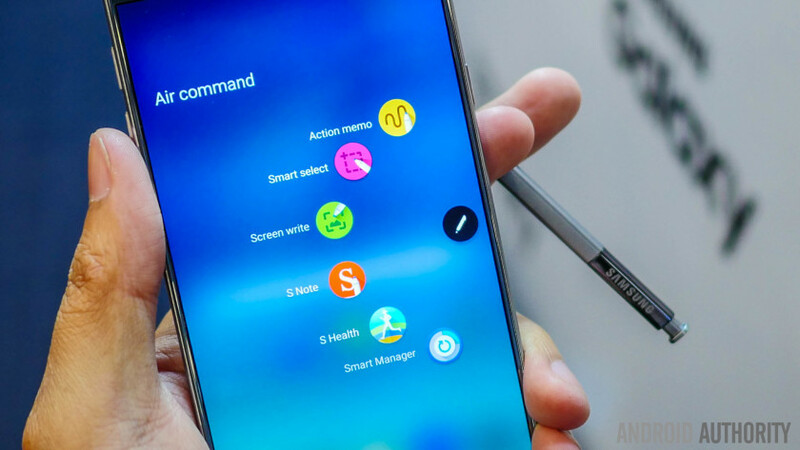 Returning hardware features include the fingerprint reader, heart-rate monitor and the famous S-Pen Samsung fans love so much. The Samsung Galaxy Note 5 is blessed with Android 5.1.1 Lollipop and takes advantage of the latest TouchWiz iteration. As with many other things in the Note 5, this is the same we have seen on the Samsung Galaxy S6. At least it’s a more toned down version of Touchwiz, which gets rid of lame tutorial pop-ups and fancy gimmicks. This is not to say Samsung’s new phablet is lacking in features, though. You can still find the theme store, a full set of toggles, multi-tasking features and the glorious S-Pen tool set all Note fans love. Samsung has also improved the S Pen experience a lot here. First, the Note 5 includes a new way to start an action memo from a turned off screen. Simply pulling out the S Pen when the phone is locked will result in a slightly lit up black slate that will let you quickly write down a memo. There’s also a new scroll capture mode in Screen Write, allowing you to take and piece together multiple pictures of the same webpage in order to have the entire webpage available. Finally, Samsung has also redesigned the Air Command window a bit. Fading out the background a bit, giving you access to the three main functions of the S Pen, but also a few application shortcuts. This gadget packs the same 16 MP camera with f/1.9 aperture and OIS we found on the Galaxy S6. In short, this means the Galaxy Note 5 has the best smartphone camera in the industry! It’s also paired with a good 5 MP front-facing shooter, so you can keep on taking those awesome selfies. While the hardware might not be different, the camera software has received a few notable additions. There is a new video collage mode, and there’s also a new live broadcasting to YouTube mode that makes it easy to do a live broadcast stream right from the camera app. So there you have it, guys! There are certainly pros and cons when taking on the S6 design, and while we do think this makes the new Note feel more premium than before, the design does omit some of the features we were hoping that the phone would continue to have such as a microSD slot and a removable battery. We can’t help but think some Note loyalists are going to be more than a little disappointed by some of the concessions made here, but really with all the features found inside, it really shows that Samsung has reached a far point in their smartphone game. There’s a lot to like about the Note 5, especially for long-term fans of the series, even if there are also some very real steps backward. How you feel about the device will largely vary, depending on how much you care about the missing features that the Note 5 ditches from the Note 4. What do you think about the Note 5 so far? Are you thinking about getting one? Let us know your thoughts in the comments.